Every single moment the people are getting closer and the borders are getting smaller. With the increasing rate of international marketing, it seems as if the world has grown up as one country and each & every person on the globe has become a global citizen. Now people have become more connected than ever before. From information to services, every single thing can cross borders without any obstacles. Now the product that is produced in the U.S. can be available in almost all parts of the world. Have you ever wondered how it all started? I guess you did! It all began with the tsunami of globalization. The world become smaller, the distances become shorter and things started moving a little closer. Globalization not only speeds up the interconnection between the nations but also helps nations to build strong social relations that eventually result in the formation of a global village. A global village is where practices and ideologies of a country can be freely exchanged and acknowledged across the borders. By the term globalization we mean the emergence of a cohesive global economy by the integration of the various economies of the world. In simple words, globalization is an effective way through which national economies, cultures, societies, industries and markets have amalgamated by the international network of trade and communication. Cutting down or abolishing the trade barriers between the nations and allowing free flow of goods and services. Making an environment that is secure for the flow of capital across the borders. Permitting the free flow of advanced technology and techniques from developed to developing countries. Creating a healthy atmosphere for the skilled employees to move freely from one country to another. This will help in reducing the unemployment and eliminating the poverty. Allowing the peaceful flow of communication between the countries of the world. This will help countries to understand the culture, tradition, and lifestyle of the other countries. If you trace the history, you will discover the four distinct chapters of globalization. With the improvement in the naval technology the first phase of globalization was originated in the sixteenth century and the industrial revolution in the late 18th century marked the beginning of the second phase of the globalization. The third phase took place in the late 19th century and the end of 20th century gave rise to the modern stage of globalization, in which the flow of cross border trade between developed and developing countries boost up with a rapid rate. With the aim of stimulating trade relations by breaking down the borders between the nations, the Second World War gave rise to the Modern globalization. In this period, many South American countries gained their independence and so they started their own economic system. This made them set up trade relations with the other well-developed nations of the world. This import and export of goods and services between South American countries and other countries marked the beginning of modern globalization. The major milestone in globalization was the formation of World Trade Organization (WHO), which promote the free trade across the boundaries, reduce transportation cost, eliminate capital control and cut down subsidies for local business. With the rapid increase of globalization in the modern era, it becomes necessary to analyze its effects on the countries of the world. To check the impact, we examine its different component. The total worth of all goods and services produced within the boundaries of a nation in a period of 12 months represents the GDP of the country. It is the primary indicator of a nation’s economic output. The growth in GDP of a nation signifies the positive impact of globalization on it. The ultimate goal of globalization is to transform every developing nation to a developed nation. The process of transforming a developing nation to a developed nation by the social changes and economic development is industrialization. Globalization is not only the flow of economy and services across the boundaries. It in fact comprises flow of education, health, labor and many other aspects that lead to the overall development of a nation. HDI helps in the analyzing the effect of globalization as it suggests that the people and their capabilities must be the foundation of determining the development of a country, not only the economic growth. HDI is calculated on the basis of 3 components: life expectancy, Education index and per capita income of a country. The most important impact of globalization on the people is the increased employment opportunities. The industries and international market provide new jobs to local people. Although employment facility is more for rich and educated people as technology demands techniques and techniques come with education and experience. Developed countries are setting up their business in developing countries due to the availability of raw material and natural resources. These companies purchase raw material at lower cost, produce final product and sell that in higher price which ultimately lead to the profit to host country. On the other side, raw material adds foreign currency and wealth to the local economy that can be further spent on infrastructure, health and education of the people living in the home country. The formation of World Trade Organization due to globalization has made the flow of trade easier and more convenient. Look around yourself and you can easily witness its impact on people. Free trade and lesser subsidies have encouraged manufacturers to grow their business in the international market. The market of international trading is growing at a rapid rate. With this growth, the competition among the companies is also increasing every day. Today, the customer can compromise with prize but not the quality, the competition to give the best has also given rise to the production of high quality products. Communication is the key for solving every problem. Globalization is helping people in sharing their ideas, traditions, cultures, thoughts, lifestyles and experiences beyond the borders. People have started feeling that they belong to one world, a world with no borders. Communication has broadened our minds and thrown out the narrowness. It has also increased our awareness towards international events and made us closer to each other. Globalization has increased access of international facilities like Technology, Consumer goods, Healthcare and Education. Now student can study anywhere in the world. If you see the student pool of Ivy League universities of U.S.A., you will find students from Asia, Russia, Australia, Africa, and all over the world. The access to education is not only decreasing the barriers between nations, but also making students aware of the international technology. The world is full of professional and skilled doctors. Name it and you will get the best for your treatment. How is it become possible? Globalization! It allows you to access the best facilities for your health by providing the specialist sitting anywhere in the world. The competition for survival is rising every moment. All the nations are planning and making strategies to take benefits and resources from the international market. As a result, the outsourcing to the developing nations is growing at a faster rate as environmental costs and labor are lower, and profit is higher. This increasing industrialization is exploiting the natural resources and skilled labor of the developing nations. The developing countries supply raw material to the developed countries, where after the production the final product is sold at much higher price in not only in their country, but also in the developing countries from where they obtain the raw material for that product. Result? Much higher profit to developed countries! Before the emergence of technology and multinational companies, people were still surviving with their local business, handicrafts and small industries. Now these small sources of income are facing a great threat from MNCs. Local economy has suffered a lot due to globalization. Increased international businesses and growth of MNCs also results in increase imports than increase in exports, leading to adverse effect on local economy of the country. One of the goals behind this globalization is the flow of culture beyond the borders. The goal was set to lessen the gap between people of different cultures and to live peacefully as one nation. However, the reality is far different from this. The culture and trend of the developed nation is attracting a large number of people living in developing and underdeveloped countries. As a result of this, they are forgetting their own tradition, culture, food, attire, custom, belief and rituals. The world that is known for the diversity is now becoming homogenous. Globalization is making rich even richer while poor poorer. Can you imagine how many poor people are working in any MNC? I guess only five in hundreds because no matters whether it's Pepsi or BMW, a poor uneducated person still give priority to farming. How many rich people are working in any MNC? Sorry, I can’t even guess. The very first job preference of any well-educated rich person will always be a top level MNC and as they work hard for that, they get that job. What is the effect? Increased poverty! The positive impact of globalization is the industrialization. Industrialization is the process of making modern industries and companies. In this process, the agricultural land is converted into the industrial land that leads to land degradation and ultimately affects the environment of the country. In the name of raw material, multinational companies are exploiting the natural resources of the earth without caring much for the environment and also the poisonous gases released in the environment by these MNCs is causing air pollution. The world has become a Supermarket and nations are various shops in it. You can now purchase products from all over the globe. Isn’t it great? Globalization is going high with a great speed. World is becoming a single community and the idea of a global village is on its way. It is no secret that globalization has improved the living standards and the quality of life in many developing countries. However, on the other side the gap between rich and poor countries is also widening due to globalization only. Countries like Australia and China have taken full advantage of globalization and have successfully spread their market globally, but the third world countries like India and Pakistan are still struggling with the problems of unemployment, poverty, education and above all the communication. In spite of many negative impacts of globalization, you have to agree that the world can’t afford to ignore the tidal wave of globalization. We can’t predict the future, but if we utilize the opportunity we can make our present much better than ever before. To take full advantage of globalization, we should take care to reduce the deleterious effects of globalization. Order a New College Essay on Globalization? Need an essay on globalization? Get instant essay writing help from our online essay writers who can instantly help you with an essay on topic of globalization. 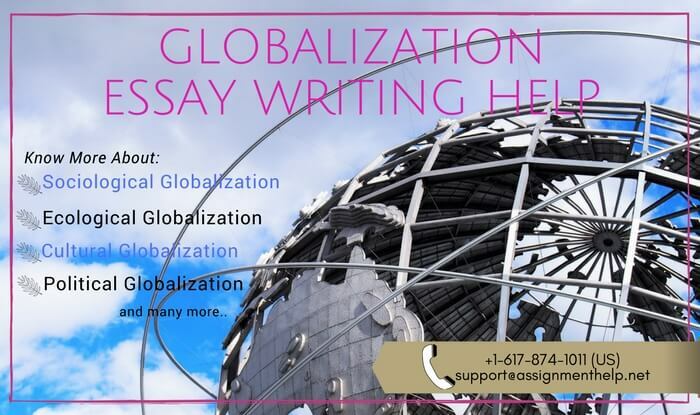 Whether you need an Essay on Globalization, Essay on impacts of globalization, Economic Globalization Term paper essay, Advantages and Disadvantages of Globalization Essay, Globalization Essay writing help or help with writing Globalization College essay, you can simply rely on our online essay writing experts who will write the best and perfect essay for you which will not only be informative and engaging but will also be plagiarism free and properly referenced with in-text citations from leading sources.